Who What Wear associate editor Kristen is really into Instagram. When she's not posting photos on her account, she's logging time on the app to be inspired by stylish women with unique points of view. Now she's turning her discoveries into an Insta Muse series to regularly share the accounts that are worth a follow. For the next installment of our series, Insta Muse, meet Christie Tyler of @nycbambi, an NYC-based influencer and content creator. Christie Tyler's Instagram recently caught my eye, and what makes her photos really stand out is her sophisticated style and dedication to a very specific aesthetic. One glance at her feed and you'll know what I'm talking about. Her photos are limited to a neutral palette of white, tan, and black with the occasional pop of red, and her outfits are built around pieces in these colors. She sticks to clean lines and modern silhouettes, and her consistency really speaks to how she found confidence in her style. For Tyler, it's a stream of classic-meets-modern outfits that draw on cool brands like Nanushka and Céline with affordable pieces from Mango and Zara mixed in. What really strikes me is her ability to blend the two and make both high and low brands feel equally elevated. Plus, the photos have a unifying aesthetic, invoking a mood that feels ethereal and vintage. When I asked Tyler about what inspires her, she named Instagram as a constant source of ideas, explaining she has discovered new brands like "Les Coyotes de Paris, Paloma Wool, Trois the Label, By Far shoes, Matteau swim, and Orseund Iris all through Instagram." But she also looks outside of Instagram to be inspired. Tyler noted that "of course Instagram and Tumblr are really amazing for inspiration, but I find that traveling really inspires me. You can be surrounded by so many different styles and stores when you are traveling." 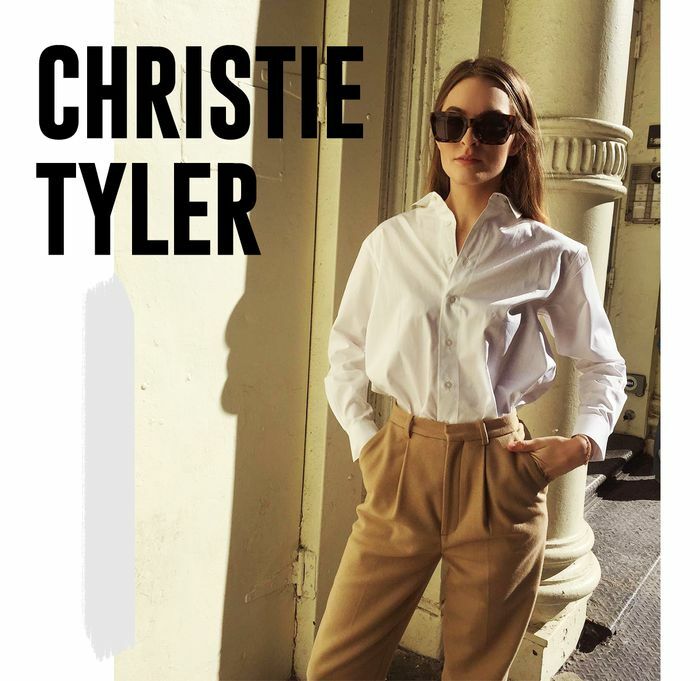 To find out more about Christie Tyler's fashion insight, keep reading. Ahead she is sharing her five essential rules for mastering NYC-girl style, including her hand-picked shopping edit to pull it off. Obviously, this won't work for everybody, but I am always comfortable in my neutral colors: black, white, beige, and warm tones. The warmth really works with my style, and I find it's just what fits me the most. Neutrals also always look classic and sophisticated, so you can go from a meeting to a party if you wanted to. In my eyes, neutrals are forever timeless. Since my outfits are so neutral and simple, I really try to dress it up with accessories. I love gold statement jewelry, a unique bag, or chic sunglasses. Hair accessories are also an amazing way to make a look even more sophisticated. Statement hats are of equal value too. I love when clothes are fitted and structured exactly to your body shape—it is flattering and the best way to look chic and professional. Of course, I love some items to be oversize, but essential pieces (like pants, button-downs, and little black dresses) should always be fitted. Having a great shoe collection is an amazing way to create a wardrobe that is timeless. I find when I invest in shoes, I actually wear them a lot more, so the cost per wear definitely becomes worth it to me. I have worn my Gucci loafers all over New York City—so much so that they are sort of falling apart. But, having beautiful shoes paired with a T-shirt and jeans can make that look effortless yet stylish. So often I'll walk out of my apartment in a full look that I am hobbling in and feeling like my bits and pieces are falling out somewhere. I can't wear super-short dresses, especially in the city where a catcall is just a block away, and ultimately they make me feel insecure because I never know when I'm flashing someone. I love wearing outfits that are chic but comfortable because that is when I feel the most confident. If you step out the door and feel unsure about something, go back in and throw on those jeans. You'll feel much better, and the time you might waste fussing with the outfit will instead be allocated to being the boss that you are. Read about last month's Insta Muse here.